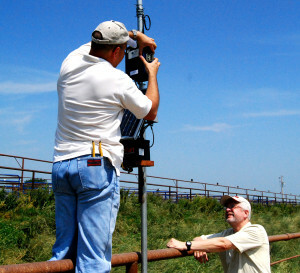 Bob Weaber, professor of animal science at Kansas State, and Don Spiers, professor of animal … Expand ▸Bob Weaber, professor of animal science at Kansas State, and Don Spiers, professor of animal sciences at MU, set up monitoring equipment for cattle heat stress research at South Farm Research Center. A CAFNR team spanning multiple disciplines is collaborating with journalism and computer science students to develop a simple smartphone app to help producers reduce heat stress in production animals. Each year, hundreds of millions of dollars in livestock losses are caused by heat stress. During hot summer weather, milk production in dairy cattle may decrease by as much as 50 percent. The reproductive proficiency of lactating dairy cows is also greatly diminished – some data indicate that only 10 to 20 percent of inseminations in “heat stressed” cows result in pregnancies. Last year was the hottest in the last 75, impacting Texas most severely but also affecting Oklahoma, Kansas, Arkansas and Missouri. Don Spiers, professor of animal sciences, is leading the team. He hopes to provide the tool to producers around the world. Team members include Marc Strid, director of educational technology for CAFNR; Anna Henry, associate professor of agricultural education for CAFNR; Raymond Massey, extension professor of applied and agricultural economics; Pat Guinan, extension assistant professor of climatology, Ben Gallup; 4-H youth specialist for MU Extension; Mike McKean, associate professor of convergence journalism; Dale Musser, director of IT in the College of Engineering; John Travlos, system administrator for Agricultural Economics Extension; Stacey Hamilton, dairy specialist at CAFNR’s Southwest Research Center; and David Kemp with the FFA through animal sciences. Although thermal stress computer indices have existed for years, they’re not widely used because they require complex combinations of environmental and physiological data, Spiers said. The app would take a much simpler approach. With the app, producers could enter animal information, such as breed, age and health that characterize animal performance in high temperatures. Later, they hope to incorporate remote entry of individual animal information, such as respiration rate, to more specifically determine animal response to heat stress. This would be combined with streaming weather data to create an instant snapshot which producers can use to make real-time decisions about managing their herds. These decisions can include moving the animals into shade, giving them more water or altering their diet. Another component of the project is to craft the app to be an educational tool for science teachers — providing them with a compelling and interesting tool to engage students and deepen their understanding of climate’s impact on humans and livestock. Journalism students will publicize the app, giving them an opportunity to exercise their communication skills and inform the public about practical uses of research. “The wonderful thing about this is that it is a truly a collaborative research and educational effort both within and outside CAFNR,” said Bryan Garton, associate dean and director of academic programs for CAFNR. Students will test the app through spring and into late May, finally being unveiled to the public at the Southwest Research Center in Mt. Vernon, Mo. The app will also be demonstrated in the beef, dairy and swine pavilions of the Missouri State Fair and CAFNR’s out-state research center field days throughout late 2012. The group has applied for a larger USDA Agriculture and Food Research Initiative grant that hopes to modify the technology to investigate climate variability and change on a global scale, ultimately creating a tool for evaluating heat stress in various animals — even humans.